Most of the time, problems can be fixed using simple troubleshooting techniques, like closing and reopening the program. It's important to try these simple solutions before resorting to more extreme measures. If the problem still isn't fixed, you can try other troubleshooting techniques. Solution 1: If your computer does not start, begin by checking the power cord to confirm that it is plugged securely into the back of the computer case and the power outlet. Solution 2: If it is plugged into an outlet, make sure it is a working outlet. To check your outlet, you can plug in another electrical device, such as a lamp or cellphone, and see if it receives electricity properly. Solution 3: If the computer is plugged into a surge protector, verify that it is turned on. You may have to reset the surge protector by turning it off and then back on. 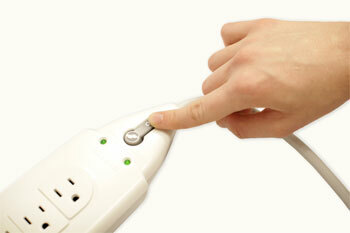 You can also plug a lamp or other device into the surge protector to verify that it is on. Solution 4: If you are using a laptop, the battery may not be charged. Plug the AC adapter into the wall, then try to turn on the laptop. If it still doesn't start up, you may need to wait a few minutes and try again. Sometimes an application may become stuck, or frozen. When this happens, you won't be able to close the window or click any buttons within the application. Solution 1: Force quit the application. 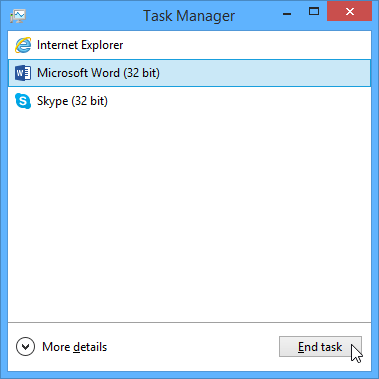 On a PC, you can press (and hold) Ctrl+Alt+Delete (the Control, Alt, and Delete keys) on your keyboard to open the Task Manager. On a Mac, press and hold Command+Option+Esc. You can then select the unresponsive application and click End task (or Force Quit on a Mac) to close it. Solution 2: Restart the computer. If you are unable to force quit an application, restarting your computer will close all open apps.